Unicorns were once considered rare. Now, the United States is home to more than 100 of these venture-backed companies, each worth more than $1 billion. But are these magical beasts really dressed-up ponies? New research from Stanford Graduate School of Business Professor Ilya Strebulaev shows that these companies report values on average about 51% above what they are really worth. And some, including solar company SolarCity and financial technology company Kabbage, are more than 100% above fair market value. Determining a startup's worth can be a challenge. Many are fast-growing and unprofitable, and almost all have complex financial structures. They raise funding in multiple rounds, offering investors different restrictions and protections, and therefore stock pricing. The average unicorn, the researchers note, has eight stock classes for different types of investors, including founders, employees, venture capitalists, mutual funds, and others. Because of that complicated structure, valuation is often based on the latest series' price, applied to all outstanding shares. But that doesn't accurately reflect the preferred treatment some investors might get, the researchers say. In some series, for example, investors are promised 1.5 to 2 times their money should an initial public offering (IPO) fizzle. In that case, other shares can be worth far less. "Some unicorns have made such generous promises to their preferred shareholders that their common shares are nearly worthless," the researchers note. One example is SpaceX, which raised a round in the recession of 2008 after several of its rocket launch attempts failed. It promised investors twice their money back and first in line should the company liquidate. At those rosy terms, investors sank more money into the company, which raised its valuation. To resolve these issues, Strebulaev and his co-author, Sauder School of Business professor Will Gornall, created a model that could take into account each contract's terms, analyzing the different modifications to see how they would affect valuation. When Strebulaev and Gornall applied their model to Square, a payments startup that was valued at $6 billion, they estimated a value of $2.2 billion. The company went public in 2015 at a pre-IPO value of $2.66 billion. "Our model is designed to produce fair value estimates that are better proxies for expected value at exit," the researchers note. The model can be applied to any startup, but for this study, "Squaring Venture Capital Valuations with Reality," they focused solely on startups worth more than $1 billion. 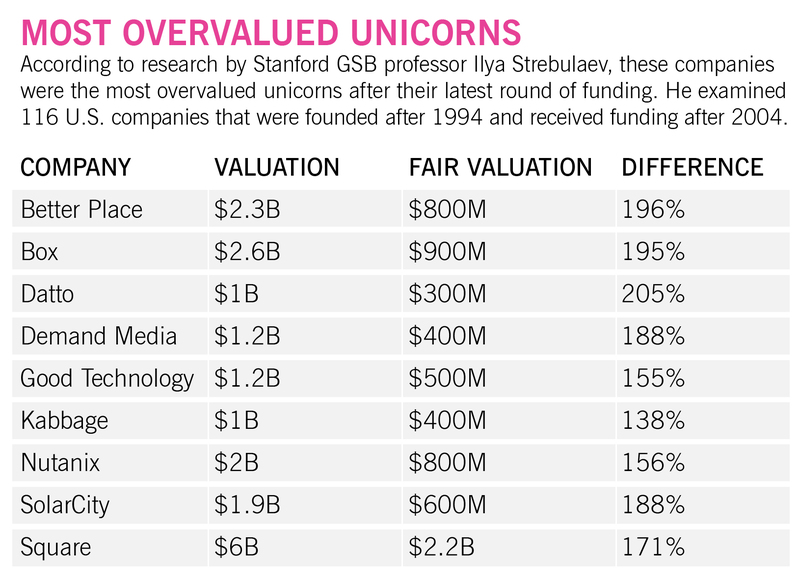 They used corporate legal filings and data from commercial Venture Capital data sets to study 116 unicorns. They limited their research to companies founded after 1994 that had raised a round after 2004. Interest in venture capital as an investment vehicle is growing. Large U.S. mutual fund providers, including Fidelity and T. Rowe Price, have started investing in unicorns, and the past three years has seen a 10-fold increase in VC-backed investments. The rise of third-party equity marketplaces has allowed mom-and-pop investors to join the game as well. And in Silicon Valley, many young workers take small salaries and large stock options, betting on a successful IPO. But the researchers note that even the most sophisticated finance professionals equate fair value and post-money valuation. "We hope to make different constituents of the VC industry -- founders, employees, investors, regulators, and consultants -- aware of the issues with interpreting the metrics traditionally used in the industry." This story was first published at I nsights by Stanford Business.